Lately, I’ve been experiencing a little thing that my friends and I like to call “puppy and baby fever”. I already have a puppy, and I don’t have plans for a baby any time soon, but I have found myself turning to pictures of these precious little ones to put a smile on my face in my free time. I blame this on working for a company that revolves around custom pet and baby products. Anyways, enough about me and my recent obsession, enjoy ten of my favorite pictures filled with so much cuteness, that I guarantee you won’t be able to make it through them all without cracking a smile. If you aren’t interested in the pictures, the very least you can do is help me out with suggestions of a new hobby-my boyfriend would appreciate it. Enjoy! 1. I’ve always been a firm believer in the idea that pets make the BEST pillows. 3. If you can’t use a dog for a pillow, at least give your baby a cat for a blanket! Or create a personalized one at T&H (Shameless plug). 5. If this doesn’t melt your heart, and call for an out loud “awwww”, then I don’t know if we can be friends. 7. Dress-up isn’t just meant to be played with older sisters! 9. Babies make excellent guards for the guard dogs! 10. 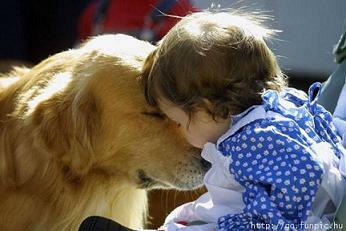 And finally, proof that the love you get from a pet, is an unconditional kind of love.